If US business became relatively more competitive, there would be greater demand for American goods; this increase in demand for US goods would cause an appreciation (increase in value) of the dollar. However, if markets were worried about the future of the US economy, they would tend to sell dollars, leading to a fall in the value of the dollar. Depreciation / devaluation = decrease in value of exchange rate. If inflation in the UK is relatively lower than elsewhere, then UK exports will become more competitive, and there will be an increase in demand for Pound Sterling to buy UK goods. Also, foreign goods will be less competitive and so UK citizens will buy fewer imports. Therefore countries with lower inflation rates tend to see an appreciation in the value of their currency. For example, the long-term appreciation in the German D-Mark in the post-war period was related to the relatively lower inflation rate. 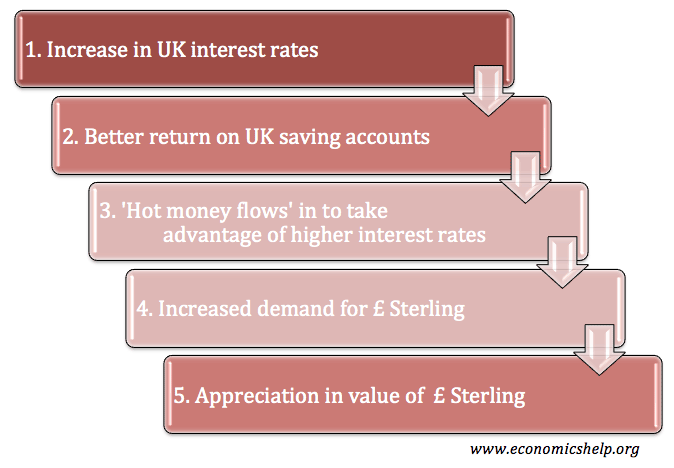 If UK interest rates rise relative to elsewhere, it will become more attractive to deposit money in the UK. You will get a better rate of return from saving in UK banks. 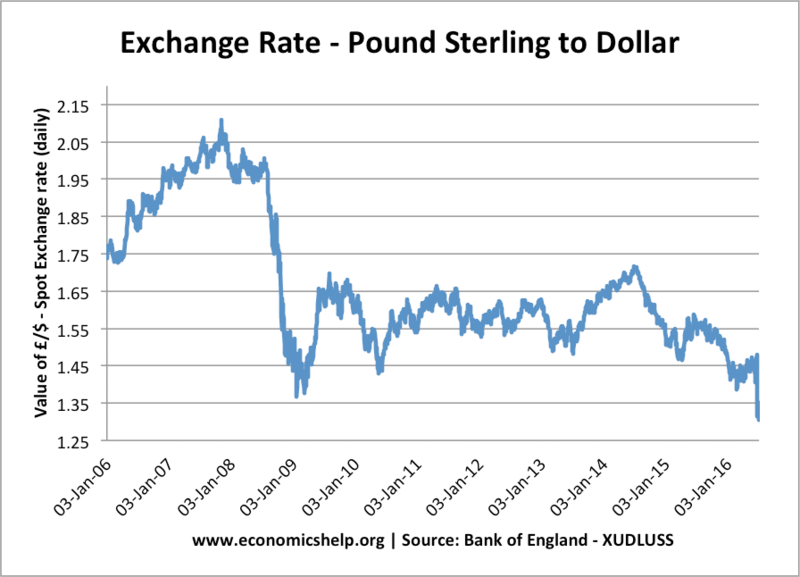 Therefore demand for Sterling will rise. This is known as “hot money flows” and is an important short-run factor in determining the value of a currency. Higher interest rates cause an appreciation. If speculators believe the sterling will rise in the future, they will demand more now to be able to make a profit. This increase in demand will cause the value to rise. Therefore movements in the exchange rate do not always reflect economic fundamentals but are often driven by the sentiments of the financial markets. For example, if markets see news which makes an interest rate increase more likely, the value of the pound will probably rise in anticipation. The fall in the value of the Pound post-Brexit was partly related to the concerns that the UK would no longer attract as many capital flows outside the Single Currency. If British goods become more attractive and competitive this will also cause the value of the exchange rate to rise. For example, if the UK has long-term improvements in labour market relations and higher productivity, good will become more internationally competitive and in long-run cause an appreciation in the Pound. This is a similar factor to low inflation. In 2010 and 2011, the value of the Japanese Yen and Swiss Franc rose because markets were worried about all the other major economies – US and EU. Therefore, despite low-interest rates and low growth in Japan, the Yen kept appreciating. In the mid-1980s, the Pound fell to a low against the Dollar – this was mostly due to the strength of Dollar, caused by rising interest rates in the US. A deficit on the current account means that the value of imports (of goods and services) is greater than the value of exports. If this is financed by a surplus on the financial/capital account, then this is OK. But a country which struggles to attract enough capital inflows to finance a current account deficit will see a depreciation in the currency. (For example, current account deficit in US of 7% of GDP was one reason for depreciation of dollar in 2006-07). 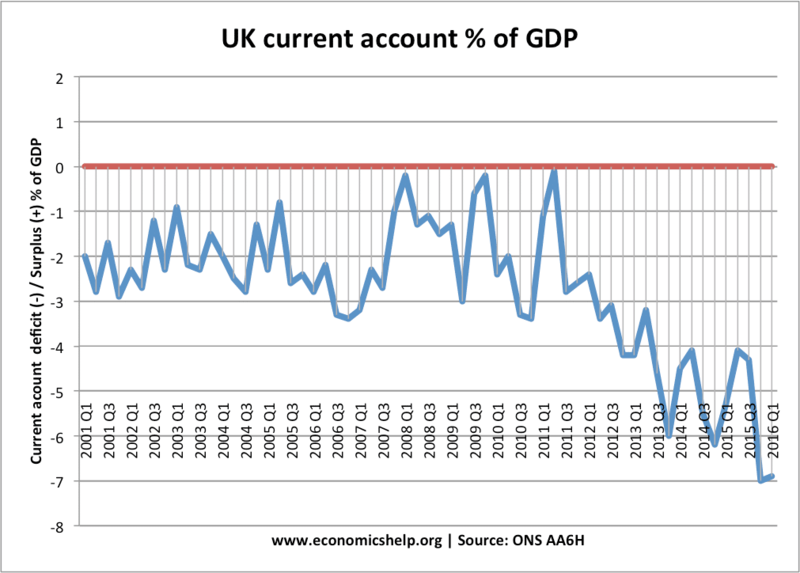 In the above diagram, the UK current account deficit reached 7% of GDP at the end of 2015, contributing to the decline in the value of the Pound. Under some circumstances, the value of government debt can influence the exchange rate. If markets fear a government may default on its debt, then investors will sell their bonds causing a fall in the value of the exchange rate. For example, Iceland debt problems in 2008, caused a rapid fall in the value of the Icelandic currency. Some governments attempt to influence the value of their currency. For example, China has sought to keep its currency undervalued to make Chinese exports more competitive. They can do this by buying US dollar assets which increases the value of the US dollar to Chinese Yuan. A recession may cause a depreciation in the exchange rate because during a recession interest rates usually fall. However, there is no hard and fast rule. It depends on several factors. See: Impact of recession on currency. Bank of England cut interest rates to 0.5% in 2008. The recession hit UK economy hard. Markets expected interest rates in the UK to stay low for a considerable time. Bank of England pursued quantitative easing (increasing the money supply). This raised the prospect of future inflation, making UK bonds less attractive. 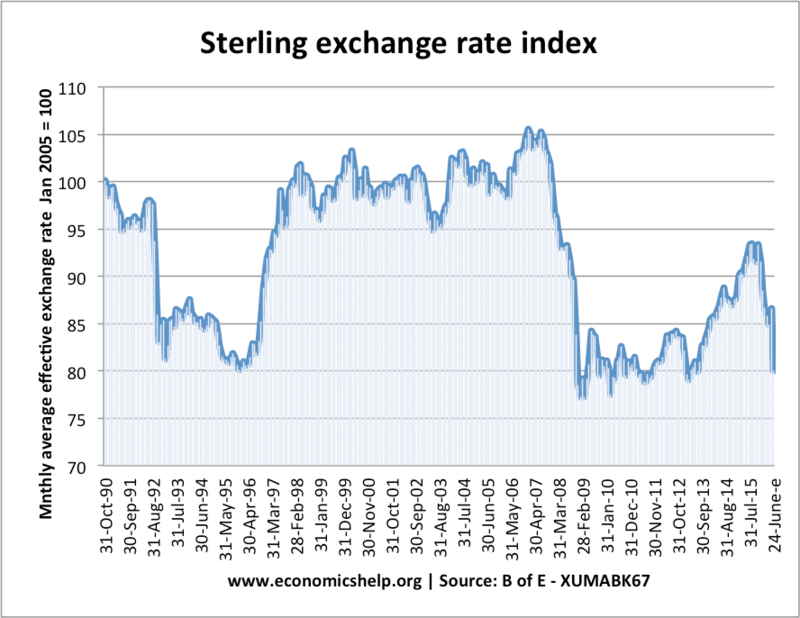 Large devaluation in 1992, occurred when the UK left Exchange Rate Mechanism. 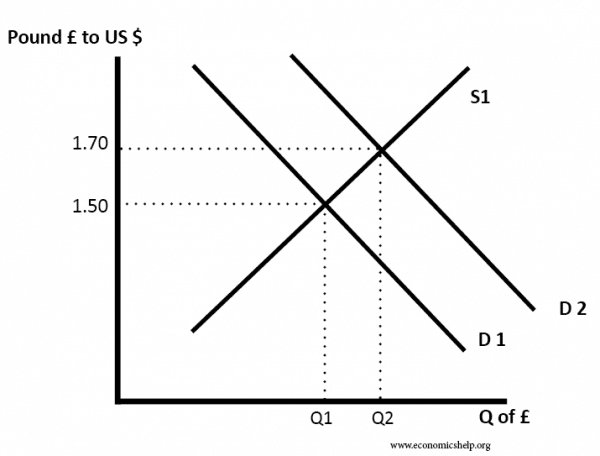 What causes a collapse in the value of an exchange rate?